Ladysmith Harbour is the largest nesting colony on Vancouver Island for the Western Purple Martin. LMS members are dedicated to seeing this Martin population recover from near extinction. We are happy to report that since 1985 when there was only five breeding pairs, it has grown to over 1100 pairs in the 2016 BC count. Due to this significant increase, the Purple Martins have been moved from the BC Red List (Threatened) to the Blue List (Vulnerable), an improvement in their conservation status. The Martin colony raised on our docks disperse to other colonies in the Strait of Georgia. Our colony, therefore, contributes significantly to the Martin population growth and BC recovery program. In December of 2014, LMS was awarded a Certificate of Recognition by the Ministry of Forests, Lands and Natural Resource Operations for our role in the stewardship and recovery efforts of the Purple Martin. 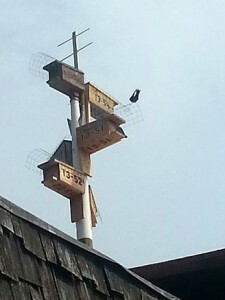 The Ladysmith Maritime Society co-operates with the BC Purple Martin Stewardship & Recovery Program by attaching nest boxes to dock pilings, watches for spring arrival of Purple Martins, helps count adult birds, and in banding nestlings. The birds and their nestlings can be conveniently observed using our on-site ‘nestcam’. An information kiosk at the top of the ramp to our docks provides information about the need to protect these birds. 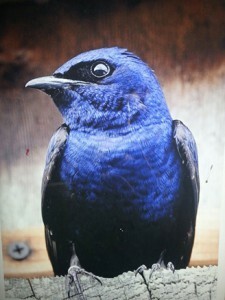 You can find more information about Western Purple Martins in BC by visiting www.saveourmartins.org. Webcam works with Chrome, Opra and Firefox only.